Edwin W. Becker was born on 10 December 1912 in Brooklyn. He moved to the Albany area in the 1930s, eventually living on Nathaniel Boulevard in the suburb of Delmar, and enlisted in the Signal Corps during World War II. An employee of the New York State Department of Civil Service, he was an agency artist for four decades. 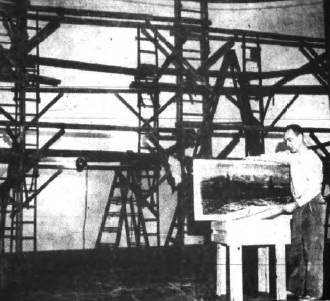 The Civil Service Mural he completed in 1962 was located where he worked: the Harriman State Office Building Campus just outside the city. In 2006, when Civil Service workers relocated into the Alfred E. Smith State Office Building across from the State Capitol, they brought the mural with them. 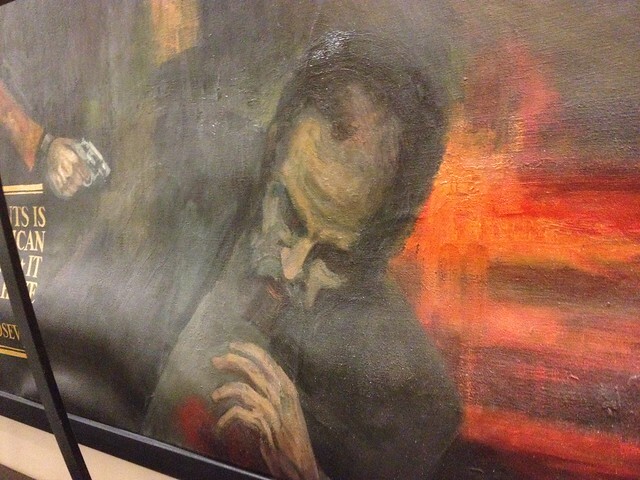 It has been on display in the Department’s reception room ever since. 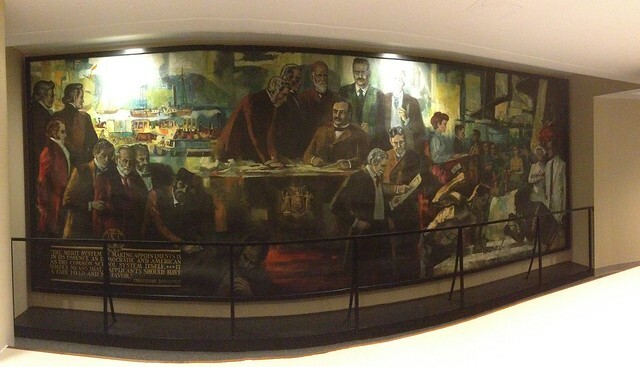 The Civil Service Mural highlights New York’s movement from a “spoils system” of patronage to the modern merit system of today. Users of patronage—DeWitt Clinton, Martin Van Buren, and Thurlow Weed, for example—are shown next to important reformers such as Dorman B. Eaton, Elihu Root, Theodore Roosevelt, and Grover Cleveland. In the left background, one can see the Hudson River, Henry Hudson’s ship the Half Moon, Robert Fulton’s steamship the Clermont, and packet boats on the Erie Canal. On the right, different Civil Service occupations are represented by various figures in occupational garb. 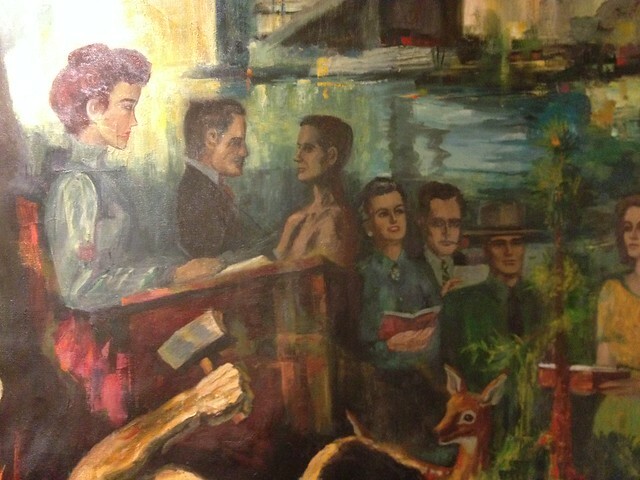 The most shocking feature of the mural reenacts a presidential assassination. Slightly left of center, the disgruntled patronage job seeker Charles Guiteau puts a bullet into James A. Garfield. The figures of several other men seem to watch as the shooting takes place, looking interested but unwilling to stop it. As listed by name at the end of this article, those men were politicians infamous for their use of patronage in political machines and opposing reforms. Though Vice President Chester A. Arthur had his own shady personal history with the spoils system, he made civil service reform the highlight of his short presidency. When he signed the Pendleton Act in 1882, it created a federal Civil Service Commission. New York was quick to make its own reforms, even instituting them directly into the State Constitution of 1894. President Arthur is buried in Albany Rural Cemetery. Along with three other Delmar artists, Edwin Becker was part of a group called “The Village Four.” They held local art showings and contests in the 1950s and 1960s. The Albany Institute of History and Art exhibited some of his works as well, where he taught art classes in his spare time. 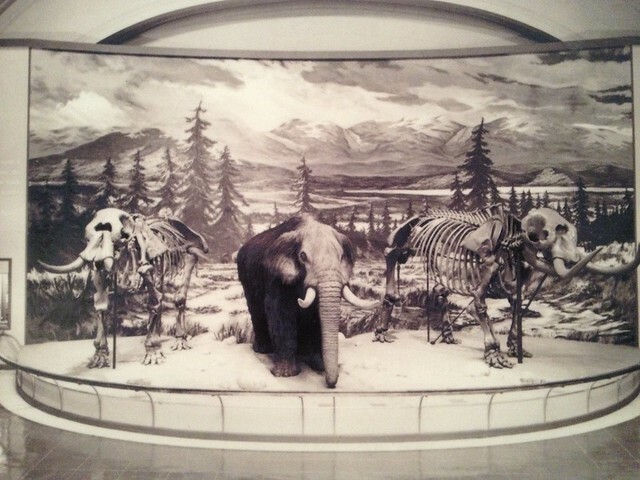 Becker also painted murals for the mastodon display at the New York State Museum as seen in this black and white image from a 1957 issue of the Knickerbocker News. His 1960 mural depicting the history of Schenectady can still be seen in the First Niagara Bank on State Street in that city. Becker died on 6 February 1989 at the age of 76. This diagram, and more mural info, can be found at the NYS Civil Service website. This entry was posted on October 22, 2014 by Fred Schrock. It was filed under Uncategorized .